You may have noticed that I’m pretty slow to follow trends, so again I’m behind the curve on the popular bodysuit. Bodysuits seamed like a bear to fit and I couldn’t see a use for one in my wardrobe. Until now. We’ll be taking a flight soon and I’m one of those people who has an ideal for what to wear on a plane. I want my legs covered so my skin isn’t touching those super gross seats. I have to carry bags and keep track of a little boy, so I want clothes that are fuss free: no retucking, no riding up, and minimal adjusting. I also like knits so I’m not a wrinkled mess at the end of the day. I’d already worked out that I like to wear jeans in winter and skirts in summer, but I still struggled with the right topper that didn’t need continual adjusting. Then it dawned on me, a bodysuit! The Juliet bodysuit and skirt from Petite Stitchery & Co. will make the perfect outfit for plane travel. It ticks off all my boxes. The Juliet bodysuit in size large with no alterations. I chose to do the low scoop back and full coverage seat. I cut and sewed my lining first to test the fit. I trimmed a little away from the cheek area on the back piece and was good to go. My fitting worries came to nothing. Next time I’d take advantage of the built-in swayback adjustment. The Juliet circle skirt size large and cut at the xsmall midi-length hemline for length. Altered to be a 1/4 circle skirt and waistband shortened to 6in finished depth. I’m not going to share how I made the alteration to a 1/4 circle skirt because I messed it up royally. You really can’t see it on, but believe me it’s there. Next time, I’ll choose a longer length- just an inch more would be great. 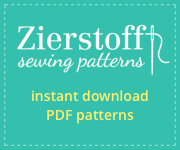 Petite Stitchery provided a complementary copy of the Juliet pattern for me to use in my post. For the bodysuit- about 3/4 yard each of Art Galley cotton/lycra paired with a rayon/spandex jersey for the lining. I found these paired well together. For the skirt- 1 1/8 yards of brushed poly from Boho Fabrics. 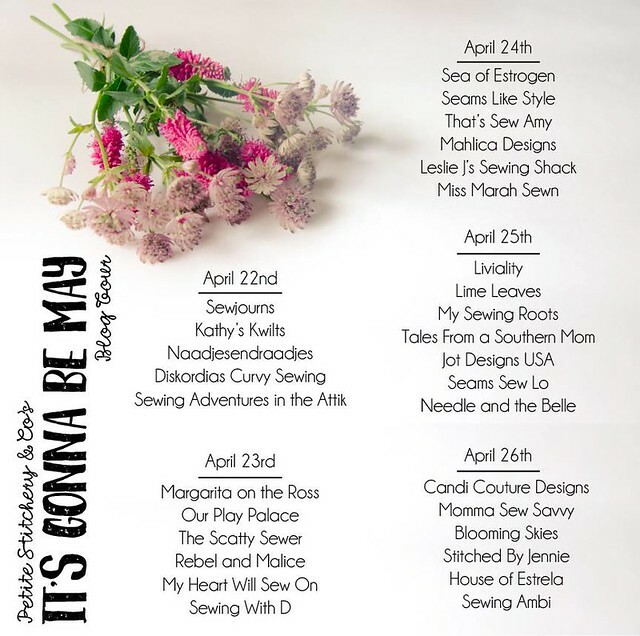 Southern Belle Fabrics is offering a giveaway for a $50 store credit to support the blog tour. I think you could make up quite a few It’s Gonna Be May inspired pieces with Southern Belle Fabrics. I personally recommend the double brushed poly for circle skirts. Enter to win a $50 store credit from Southern Belle Fabrics. Great travel outfit! I haven’t jumped on the bodysuit train, either, but I may be getting close. Looks awesome. One day I am going to have to give it a try! Looks good and perfect for travel! I like your skirt better than mine (the length and volume)! This is such a great idea and I love that it has a built-in sway back adjustment.